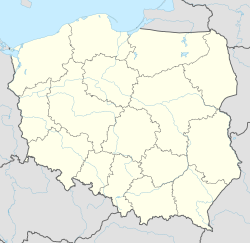 Chotowa [xɔˈtɔva] is a village in the administrative district of Gmina Czarna, within Dębica County, Subcarpathian Voivodeship, in south-eastern Poland. It lies approximately 6 kilometres (4 mi) south-east of Czarna, 10 km (6 mi) south-west of Dębica, and 51 km (32 mi) west of the regional capital Rzeszów. The village has a population of 618. The 2010 World Junior Chess Championship took place in Chotowa. This Dębica County location article is a stub. You can help Wikipedia by expanding it. This page was last edited on 15 March 2017, at 12:23 (UTC).